To launch our 75th Diamond Jubilee celebrations, The SA JML council decided to focus our efforts on encouraging youth participation and development, whilst staying true to our original objectives. 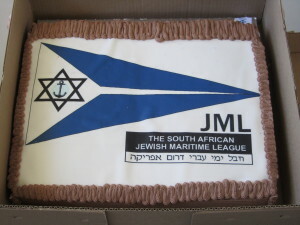 It is to this end that we partnered with Camp Kesher to provide their kids with a “fun” Maritime day. The event took place on the 26th December 2013 at the Imperial yacht club in Zeekovlei, in close proximity to the campsite in Muizenberg. The weather conditions were near perfect with blue skies and a light breeze. Our focus was on providing a safe environment for the kids to experience sailing for the first time. The activities, were both educational and fun. The 64 participants (ranging from 8 years to 16 years), were divided into groups of 12. Each group commenced their sailing session with 15 minutes of preparation (fitting life-jackets, capsize drill etc…) and moved on to 45 min of sailing. There were 2 boats on the water with 1 instructor for each. 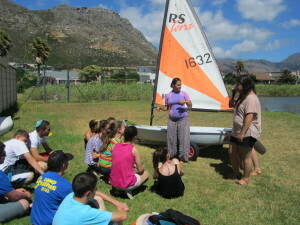 The sailing tuition was conducted by licensed instructors. While 2 groups were busy with their sailing sessions, the remainder were entertained with various “maritime” themed activities including, a water/boat safety station: – learning different parts of a boat, tying knots etc; Craft station: – wooden cut-outs (pen holders, dolphins, penguins etc) that were pieced together and glued; a cardboard boat building station and a kite making station. There was also a waterslide available. Each kid was given a “goodie” bag which include snacks, treats as well as a peak-cap. Lunch and cake were also provided. The Success of the programme far exceeded our expectations and that of the Camp organisers. The SA JML has been requested to host another day for Camp Kesher in December 2014.